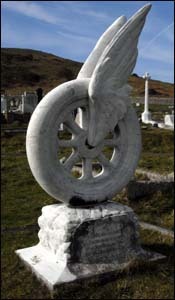 This unique gravestone, depicting a winged wheel, keeps alive the memory of a woman who was keen to challenge what it was considered acceptable for women to do. Beatrice Blore was born in Middlesbrough in 1887. Her father died when she was young and her mother re-married. The family came to Llandudno when her stepfather got a job as an electrician on the town’s pier. In June 1914 Beatrice drove a 10hp (horse power) Singer car up the Great Orme’s Cable Hill which has a gradient of 1 in 3. The feat attracted many onlookers and she was lauded as the first woman ever to drive a car up the Great Orme. Beatrice had a daughter, also named Beatrice, by local businessman George Wilkins Browne of Llandudno. The couple never married and in 1920 she changed her name by deed poll from Beatrice Blore to Beatrice Blore-Browne. She died, aged 34, on 23 November 1921 after suffering from cancer for two years. George Wilkins Browne was a businessman and racing driver who was reputed to have held the land speed record at Brooklands. By 1914, he lived on Curzon Road, Craig-y-Don. He managed the Llandudno Automobile Touring Company, which had a garage on Mostyn Broadway. He was renowned for being ruthless in business and brought many lawsuits against various local people. He later became the Managing Director of Silver Motors Limited and in later years, he was a councillor on Llandudno Urban District Council. In December 1920, George became the first person to drive a car both up and down Snowdon. He drove up and down the railway track in a 14hp Angus Sanderson car, filmed for cinema audiences. The ascent took 1 hour 22 mins, the descent 1 hour 5 mins.